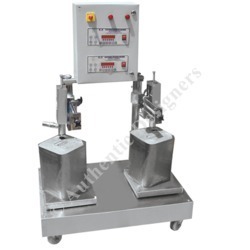 Leading Manufacturer and Exporter from Noida, our product range includes Automatic Form Fill And Seal Machines such as Automatic Liquid Filling Machine, Automatic Two head Liquid Filler, Automatic four head Liquid Filling Machine, Automatic Six head Liquid Filling Machine and many more items. This machine used for Edible Oil, Mustard oil, Chemical oil, Syrup etc other liquid product machine. Filling System: Volumetric displacement piston filler, 4 head filling.Low Maintenance. Machine Dimensions: as per drawing. 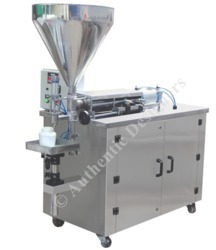 Screw Capping: Automatic Bottle capping unit for ROPP cap. Shampoo, Adhesive, Paint, Resin, Distemper, Oil, Honey, catch up, Handwash, Chatni, Semi liquid many more liquid products. Filling System: Volumetric Piston Filler. Compressed Air connection to be provided By Customer. Accuracy (%) + 5 volt. 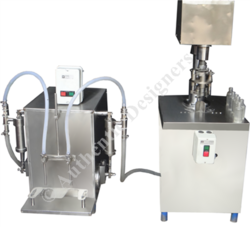 We are manufacturer of Two Head Semi Automatic Liquid filling Machine.